Welcome to the wonderful, rosy prosy world of Caraval – Stephanie Garber’s debut novel that is generating a ton of buzz right now. A tale of two sisters caught in a magical game that blurs the boundary between reality and illusion, and a tall, dark and handsome stranger to help figure it out, throw in all the comparisons to one of my favorites, The Night Circus - why, this book sounds like it was written for me! Well, actually, it was written for sixteen year olds. So, there’s that. Scarlett and Donatella Dragna live under the roof of their scheming, punishing father on an isolated island estate. Having lost their mother and with no one to turn to but each other, the girls are incredibly close but very different. Tella rebels against her father while Scarlett obeys him. Both girls want nothing more than to escape the island where they live and be free of their father. When the girls receive an invitation to Caraval from its infamous host, Legend, Tella sees a chance at freedom and Scarlett hopes to experience the magic and romance of Caraval before she marries the stranger to whom her father has betrothed her. Knowing that their father would never allow them to attend Caraval, The girls run away to go to the show, but when they arrive Legend whisks Tella away to be the winning piece in this year’s game. To reach Tella before the game ends and she is lost forever, Scarlett will have to partake in a dangerous game of intrigue and illusion that will challenge her in ways she never thought possible. You will like this book if you are into a fast-paced fantasy storyline with all the romantic, intoxicating prose that makes no sense but sounds really good. Can someone please tell me what midnight tastes like? There is a lot of this type of writing in this book – so if it’s your thing, you will love it. You will like this book if you like cotton candy – this book is like sweet spun sugar that dissolves in your mouth, leaving you with a bunch of empty calories but no real substance in the end. You will NOT like this book if you are expecting the detailed, multi-layered, intricately crafted story that was The Night Circus. I honestly do not understand the comparisons to Erin Morgenstern’s novel at all – it does not compare in substance or story. 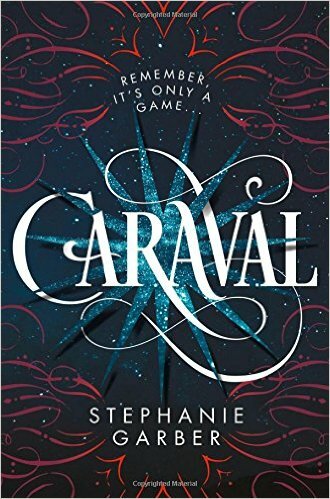 So, do not go in to Caraval expecting the same quality of writing or storyline that The Night Circus gave us. At first I really loved this book, and now that I have had some time to ruminate on it, to be honest I really enjoyed this book for what it is, an entertaining YA fantasy novel. I can see what Stephanie Garber was trying to accomplish with this novel and I get it. It is a story about the bond between two sisters set in a fantasy world, but because that alone isn’t enough to carry the story -we need muscles to drool over – there’s the handsome guy to help guide our heroine through the twists and turns of the game keeping our heartstrings and interests alive. While I really enjoyed this book and it was a quick read, I have a feeling that readers in search of a more substantial fantasy novel are going to see this for the cotton candy fluff it is – which is okay because cotton candy is delicious! Who doesn’t like cotton candy? I feel that if you go into this book expecting that – you will probably enjoy it.